Neoregelia Fireball native to South American rain forests are epiphytes where it can be found growing in trees and fence posts. 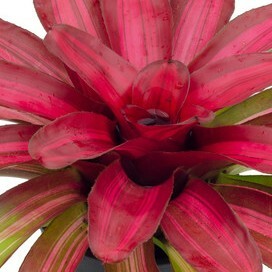 It is an extremely popular bromeliad plant known for turning deep red when exposed to strong light. It is a rapid growing plant that produces clusters of red rosettes on six inch stolons and is outstanding in tropical gardens, hanging baskets, and in terrariums. This very easy-to-care for plant will make a lovely colorful addition to your home as they can be propagated to create new plants when the mother plant produces offsets. Light: Provide plenty of moderate to bright light year-round, avoid direct sun; grows well with bright fluorescent light also. Water: Water your plants well by pouring pure, filtered water, distilled water or rain water directly into the reservoir cup to funnel it to the roots. Wait until the soil is slightly dry before watering again to prevent root rot. Keep the plant drier during the cool and winter months. Temperature: Average room temperature will be fine (65-80 degrees F or 18-27 degrees C) year-round. Do not place your plant near any cold or hot drafts. Humidity: The plants also need humid air to prosper. You can place the plant on a pebble tray or use a room humidifier Keep up the relative humidity. Fertilizer: Feed monthly year-round with a houseplant fertilizer diluted of half-strength or less. Feed leaves, roots, and reservoir. Soil: Keep the plants moist in the summertime, but not soggy. The soil must be a fast draining mix to allow air to reach the roots and prevent root rot. It should contain equal parts fine-grade fir bark and potting soil to allow water to drain off quickly. Repotting: Repot annually in spring until plant fills a six (6) inch (15 cm) pot. Small pots help induce blooming in mature plants. The plant blooms once and dies. When the parent plants dies, plant the offsets to renew your plant. Propagation: Remove offsets by cutting them off as close to the main plant as possible and pot them up when they are at least 3 inches (7.5 cm) tall. Provide them with high humidity for a month after planting. You can do by covering them with a plastic bag for several days. Common Problems: If the edges of plant start to turn brown, raise humidity with regular misting with room temperature water. Also, periodically leaching plant eliminates any soluble salts that have built up in the soil. Do this by slowly pouring warm water into the plant, making sure to cover with every square inch of the soil. Let the water wash through the soil and drain out. The Neoregelia Fireball will definitely make a great conversation piece while it adds warmth, beauty, and a tropical feel to an interior space.